Flexographic Printing Inks Market size was over USD 10 billion in 2017 and will witness a CAGR more than 4.5% between 2018 and 2024. Flexographic printing inks market size will be majorly driven by the positive growth in the packaging industry. Mounting commercialization of flexible packaging owing to its widespread application across various consumer items will directly propel the flexographic inks size over the projected period. Food packaging industry in Asia Pacific has shown a surge of 30% in the recent years. Packaging manufacturer such as Tetra Pak had announced in 2017 to open a USD 26 million facility in Thailand to capture the region’s rapid packaging industry growth. Packaging is extensively used in cosmetics, food & beverages, pharmaceuticals and personal care products. It is a key marketing tool that fuels the purchasing decision of the customer. It increases the aesthetic appearance, offers product differentiation and also enhances the company’s brand image. Moreover, strong growth in these aforementioned industries, particularly due to improved consumer spending will eventually augment the flexographic printing inks market size by 2024. The flexographic ink posses volatile organic compounds (VOCs) and therefore it is stringently administered by the FDA regulations for packaging applications across food & beverage and cosmetic industry. This may prove to be a hindrance in the flexographic inks market size over the estimated timespan. However, the product delivers efficient drying characteristics, which offers improved and swift printing rate. It is also required for high-speed printing processes due to its tendency to firmly follow the printing surface which will propel the industry size in the near future. Water-based flexographic inks led the market share accounting over 45% of the overall flexographic printing inks market size in 2017. Water-based inks are broadly used in paper, newspaper and cardboard printing. Increasing non VOC based inks demand is considered to be the major factor propelling the industry size for the product in the coming years. Furthermore, favoring government norms towards low VOC product along with low cost and abundant availability of water (as a solvent) will further augment the flexographic printing inks market size by 2024. Solvent-based flexographic printing inks market registered more than USD 2.5 billion in 2017. These inks provide high durability and are compatible with a large variety of substrates. Additionally, these inks provide scratch resistance and superior printing rate properties. These value-added product characteristics makes it preferred across packaging applications. Nevertheless, stern regulations from FDA and EPA towards VOC contents and emissions may hamper growth for the product. 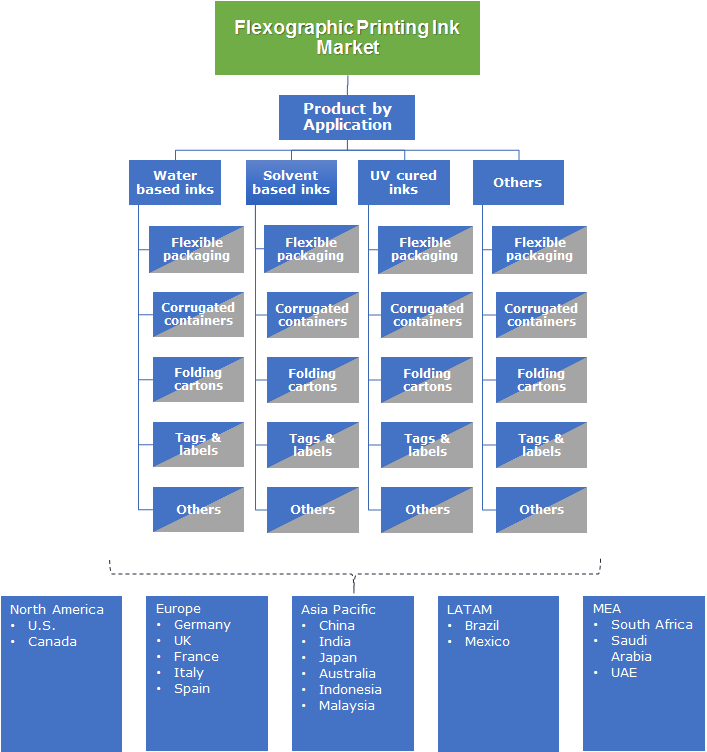 The flexographic printing inks market for flexible packaging applications recorded a CAGR over 4.5% in the projected timeframe. 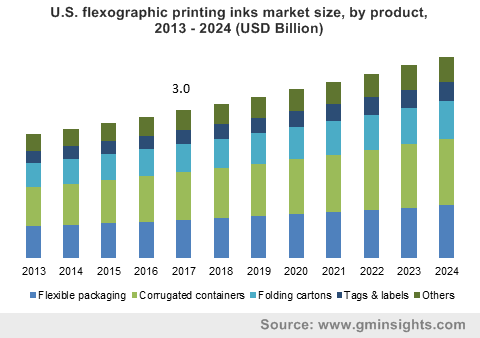 Strong flexible packaging industry growth on account of escalating end-user industries such as food & beverage, pharmaceutical and cosmetics will subsequently boost the global flexographic inks market share in the coming years. Flexible packaging manufacturers are introducing digital and innovative printing techniques to expand their industry share. For instance, Skratch Lab redesigned its entire product portfolio with new digitally-printed and highly functional packaging creates for a more attractive shopping and user experience for fitness enthusiasts. It demonstrates superior characteristics including sealing, strength, aroma retention and barrier against moisture. Moreover, it also plays an important role in improving exterior aesthetics, product differentiation, expanding the global flexographic printing inks by 2024. Asia Pacific led the total flexographic inks market and accounted for more than 35% of the industry size in 2017. Changing consumer lifestyle dynamics has significantly propelled the foremost end-user industries such as pharmaceuticals, cosmetics and food & beverage. These abovementioned industries necessarily require the product for packaging applications in order to gather customer attention by making the product look attractive. Additionally, increasing spending power of population in China and India will stimulate the regional industry size over the estimated timeframe. Europe flexographic printing inks market share is projected to grow at a CAGR more than 3.5% by 2024. Prevalence of strong cosmetic manufacturing and consumption in the European countries including France and Germany is the major factor contributing the flexographic printing inks market size in the region. Flexographic printing inks market share is highly fragmented due to prevalent number of large, medium and small scale manufacturing companies. Some of the prominent industry share players are RUCO Druckfarben A.M. Ramp & Co GmbH, TOYO Ink Group, Zeller+Gmelin GmbH & Co. KG, INX International Corporation, T&K TOKA Co. Ltd, Wikoff Color Corporation, Sun Chemical Corporation, Siegwerk Druckfarben AG & Co. KGaA, ALTANA AG, XSYS Print Solutions (Shanghai) Ltd, Flint Group, Zhongshan DIC Colour Co. Ltd., Tercel Ink Group, Jiangmen Toyo Ink Co. Ltd. and Taiyuan Coates Lorilleux Inks Chemical Ltd. Presently, industry players are involved in new product development to expand their product portfolio and capturing industry share. Also, key industry share contributors are focusing on manufacturing and promoting eco-friendly products and also abides by government regulations towards VOC. For instance, Toyo Ink Group introduced an upgraded line of high-performance polyurethane-based surface and lamination inks for flexo printing. This new range of inks represents the company’s advanced cross-link technology for polyurethane resins, enabling it with superior content resistance, heat resistance, low solvent retention and very low odor. Flexographic printing is the major printing technique majorly used in flexible packaging business. The technique gained enormous popularity owing to its associated characteristics such as compatibility with many substrates. These inks are majorly used in the end-user industries such as food & beverage, cosmetics and pharmaceuticals. Asia Pacific accounted for the major industry share chunk in 2017 on account of strong with in these industries.